The ScanPro 2200 software is an intuitive Windows® computer application with familiar icons and text labels. And, an on-screen help menu is available for all controls to help any user at any time. Skill levels of microfilm users vary from the occasional user to the advanced researcher. You can customizable the tool bar, tabs and button controls to match these skill levels where features can be selected with just a single click. E-ImageData has revolutionized the lowest cost microfilm scanner on the market today – and, it’s full of value. No other equipment on the market can match the ScanPro for its proven track record of performance and reliability. 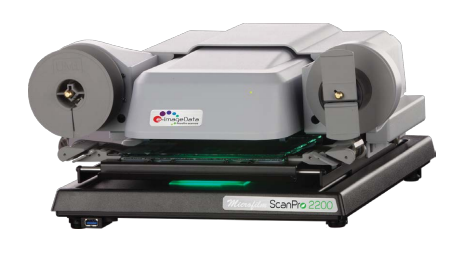 The ScanPro 2200 uses the same accurate film positioning carriers as the ScanPro 3000. These film carriers are built for the rigors of public use. And, all of the moving parts on these film carriers utilize steel bearings for ease-of-use, precision film movement and trouble free performance. These film carrier are designed to be Library Quiet™ and are ideal for research and study environments. The ScanPro 2200 and 2200 All-In-One can be upgraded to the 3000 at any time. The ScanPro 2200 All-In-One comes with a ScanPro Advantage membership that provides advanced software never before offered on a 2200. These features include AUTO-Scan® Pro that scans up to 100 images per minute, the ability to auto-adjust each scan for proper brightness, PowerScan Productivity Suite (OCR software) that provides the ability to save scans in many file formats, OCR while scanning and the ability to link directly to a database for information look-ups. To retain of all these features and benefits, an active ScanPro Advantage membership is needed. The membership fee is $249 year and the first six months is free. No other scanner on the market can provide these upgrade capabilities. Contact us for details. Convenient front access USB port conveniently located at the lower front left corner of the scanner. This port will accept both USB2 and the new high speed USB3 portable flash drives. The ScanPro 2200 uses ABBYY Fine Reader to OCR your microfilm. This world class OCR software is consistently picked by researchers for accuracy and speed. You can create PDF/A files, the standard for archival storage, with just a single “click”. Only ScanPro scanners provide this capability. Our roll film carriers are designed for quiet operation in library and office settings. Patrons and researchers consider these roll film carriers the best in the industry. Our ScanPro microfilm scanners have a proven track record of performance and reliability backed by factory trained and certified resellers.